Independent agents are being challenged like never before to find ways to sell more with less. The prolonged economic downturn has made competition for sales tougher than ever, even as business partners have curbed support staff and resources for agents. But top producers aren’t sitting back. They are using tools and approaches that help them attract, sell to and serve clients, no matter what the economy is doing. In today’s marketplace, self-sufficiency is king, and independent agents are taking technology, proactive service strategies and entrepreneurial acumen to the max. Here is a look at how this is playing out. Pure and simple, agents want “services that save them time and make them money in terms of more sales and better customer retention,” says Mary Art, director-technology research at LIMRA. TheWindsor,Conn., firm has been researching agent and consumer preferences in this area for the past couple of years. Faster, more efficient issuing of policies can save everyone time and result in a more satisfied customer, she says. Joe Astalos, principal of the Astalos Insurance Agency,Encino,Calif., couldn’t agree more. Delays of whatever kind can create problems for both agent and client, he says. LIMRA’s research has also found that “agents like service and functionalities that make them look good in front of the customer,” says Art. Many agents agree. Phillip Harriman, founding partner of Lebel & Harriman,Falmouth,Maine, is one of them. “For an independent agent like me, who represents 12 or more insurance companies, my reputation and integrity are at stake,” he says. Offering superior service “is also a matter of personal pride—that I won’t let down the people who trusted me [with their insurance],” he adds. So, what are agents doing to get what they need to stay out in front? For one thing, they are increasingly leaning on technology. This includes more than online access to pending business status and client account information, and phone access to the company. Agents are also showing more interest in having the ability to complete and submit applications online and to use e-signatures, says LIMRA’s Art. Not all independent agents want to use more technology, of course. After all, many prefer to provide the service to clients themselves because, as Art puts it, “The contact is always a chance for another sale.” Still, many agents have told LIMRA that they are willing to have their customers go online for ser-vices that they want and expect, such as online bill pay. In those cases at least, they want their carriers to meet customer expectations. Some agents are also looking to carriers for assistance with marketing suites, prospecting and client builder systems, points out Chris W. Ford, an independent agent and advanced markets specialist for CapitalCare America Inc.,Big Lake,Minn. “They want access to telephone sup-port for in-force policies too,” Ford says. Some agents are crafting their own technology solutions. For example, Harriman says his firm has taken to down-loading key pieces of policy information (values, no-lapse status, etc.) on cases for high-net-worth clients at least on an annual basis. The contracts are often policies that have a specific purpose in an overall estate or business succession plan or trust. The agency needs to have that information close at hand, Harriman says, so staffers can respond immediately if the client or the client’s financial team calls about making a policy change—such as policy loan or premium payment change on a universal life (UL) contract. Changes like that could affect performance of the policy and of the overall plan of which the policy is a part, he explains, so he needs to review current policy data in order to provide informed guidance. The agency does try to obtain the data from the issuing company, Harriman says. But those inquiries often get stuck in telephone hold or trigger responses that are incomplete or not suited to the case particulars, he says. That is why his firm developed its policy update process; it’s a workaround that enables staff to at least start working on the client’s inquiry, even as it waits for the desired information from the carrier. As an aside, Harriman says it would really help agents if carriers were to offer what he calls an “advanced help line.” These would be customer service hotlines for agents to use in advanced cases. Today’s customer service reps at carriers often do not have sufficient expertise or resources available to meet advanced support needs, he says, but an advanced support team—somewhat comparable to an advanced sales team—could do that instead. He points to trial initiatives with electronic applications and tele-applications as examples. In addition, some have leveraged today’s greater underwriting knowledge and actuarial acumen to make further cutbacks on requiring blood work, EKG results and physician reports. Such efforts can make things easier for the client and cheaper for the companies, he says. Some large, multiline agencies have taken it upon themselves to push the technology envelope in order to stay competitive with pre-and post-issue ser-vice. One example is Althans Insurance Agency Inc.,Chagrin Falls,Ohio. This is an independent agency that does a lot of property-casualty and employee benefit business, but also some life insurance on the group side as well as for estate planning. To provide round-the-clock service, the firm uses a telephone and email system for after-hours calls. Each night, the firm uploads an up-to-date client list to its after-hours answering service, says Tom Arnold, vice president-operations. When a call comes in from a customer, the answering service verifies the client’s name, address and agent’s name against the client list and then takes down the caller’s information. If the inquiry is routine, the service shoots an email to the agent, who gets back to the client the next day. If it’s an emergency, the service notifies whichever agent is “on call” that evening and that agent gets in touch with the client immediately. The arrangement is “not cheap,”Arnoldsays, “but it enables us to respond immediately.” The Althans agency also uses document imaging for all documents, so the workflow is entirely paperless,Arnoldsays. Whether it is an application, endorsement, contract or other document, it’s all online and staff can access it remotely if necessary. If a document arrives in paper form, the staff scans it into the computer and then destroys the original. Because of this system, “the information is always at our fingertips,” saysArnold. The paperless system has enabled fewer people to handle more clients and it has helped the firm’s agents to do more, he says. “We can pull the information quickly, so we can answer questions faster. Often, there is no need to call back.”Arnoldestimates that his agency’s revenue has increased by 30 to 40 percent since 2003, the first paperless year, with no increase in staff. He reiterates that life insurance is a small part of the business, but adds that life insurance documents and call-ins— whether for individual or group cases— are handled the same way as all the others. “The insurance companies are relying on agents to do more, so this is how we are filling the gap,” he says. Independent agents are also asking their distributors for increasing amounts and a widening array of help. Distributors include brokerage general agents (BGAs), field marketing organizations (FMOs), independent marketing organizations (IMOs) and, in the case of registered products, broker/dealers (B/Ds). “Agents are turning to these outlets for traditional distribution services, as well access to multiple carriers, products, specified rates, commission levels and quick turnaround on applications,” says Bill Zimmerman, president of LifePro Financial Services Inc., a BGA fromSan Diego,Calif.They are also using distributors for assistance with needs-based selling and case design, he says. In addition, they want constant communication on the status of submitted cases. Some distributors provide this manually, but Zimmerman says technology is helping here too. For instance, his firm is using an automated system that tracks cases and sends out “status check” emails to case managers if a case goes beyond the range established for the particular carrier. Independent agents are looking for before-the-sale assistance too, says CapitalCare’s Ford, who is an FMO as well as an independent agent. Examples include help with leads, mailers, preset appointments, marketing materials, applications and illustrations. They want post-sale support as well; for instance, for policy reviews, beneficiary receipt of funds and tax assistance related to a policy action. In today’s market, fast turnaround is extremely important, Ford adds. “The agents often need help from the distributor right now, not in three or four hours, so they can get the policy in force as fast as possible.” Astalos, the Encino-based agent, has additional requirements. The distributor must have expertise, experience and industry connections, he says. One distributor he used to deal with regularly turned down his requests for flexibility in underwriting an overweight applicant, he recalls. There were so many “no-s” that Astalos says he decided to search for another distributor. Now, he says, things are better because his current distributor responds quickly, is up to speed on current underwriting approaches, does follow-ups to be sure he and the clients are satisfied, and searches out alternative solutions. The distributor also has critical con-nections at the insurance companies; this is a major asset when a sale hinges on accurate—and prompt—answers to certain questions, Astalos says. Example: One of Astalos’ clients, an attorney, had raised some legal questions about a life insurance plan. Astalos didn’t have the answers. But instead of calling the insurance company’s 800 number, he called his BGA. The BGA not only provided some of the answers himself, but he also set up a conference call with the expert at the insurance company who answered the rest. The result? The client signed the application. Agents look to distributors for compliance support too. Take Marc Silverman, founder of Silverman Financial,Miami,Fla.He does a lot of investment work, which must be in compliance with the rules of the Financial Industry Regulatory Authority (FINRA). He says he depends on his B/D to be sure his firm is doing things right from a compliance stand-point. “Even though we believe we are doing things right, we want to make sure we are in fact doing them right,” he says. 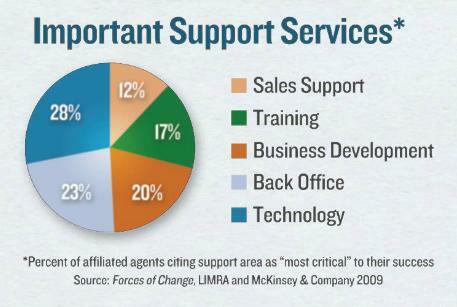 To stay competitive, agents also need help with business development, says LifePro’s Zimmerman. This includes assistance with meeting client needs, office management, staffing, partnering, brand awareness, peer-to-peer networking, mentoring and more. Some larger BGAs and B/Ds are stepping into the breach, Zimmerman says, citing his own firm as an example. So some independent agents are turning to these distributors for this kind of assistance. But many BGAs do not provide business support, so other agents are hunting around elsewhere for business development support. Linda Koco, MBA, is a contributing editor to InsuranceNewsNet, specializing in life insurance, annuities and income planning.